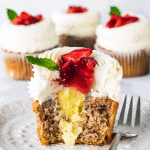 Welcome to my blog, Pies and Tacos, where most of the recipes are actually about cupcakes! 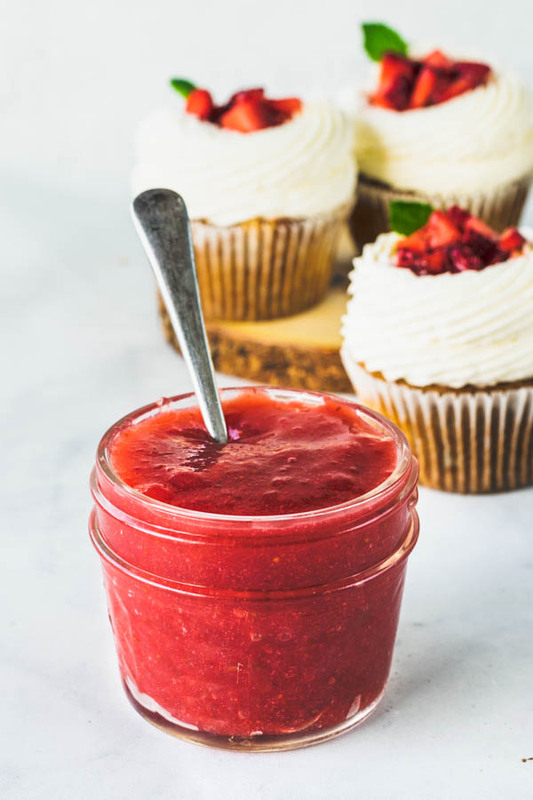 And today I have Strawberry Cupcakes on the menu, plus a reflection on my blogging journey this past year. Read on. So, yes my blog is named Pies and Tacos. I do post lots of pies, but not a whole lot of tacos. At least not as much as I should for a blog that has the word tacos in its name. Anyway, when I first started my blog, I wasn’t completely sure of what direction it was going to take. And since I really love eating tacos, I thought I would be posting lots and lots of tacos. And I did post some, including some tortilla recipes too. However, as things evolved, I started to find out more about myself, about my style, and what I really love photographing and writing about on my blog. 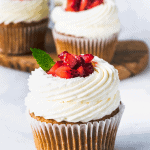 These Strawberry Cupcakes are, for example, the type of food I am crazy about making and photographing. And that is probably due to the fact that I grew up in my grandma’s bakery, right down the street from my house, where I daily admired my baker grandma make amazing beautiful desserts, and breads, and display them in a beautiful case, for everyone in the neighborhood to take home and enjoy. Anyway, through trial and error, I found out the things I like and don’t like making for my blog, regardless if I like eating them or not. I looooove salads, and you wouldn’t believe tofu is my main meal 3 times a week. But it’s just not the type of food I enjoy photographing and writing about. I believe my art is deeply rooted in these sweet childhood memories of bakery cases, and beautiful pastries. And that is why my blog pretty much look like the case of my bakery, if I were to have one like my grandma’s. So, maybe I will make some more tacos for the blog sometime soon. I make them on a regular basis for my family, because we love it. My son Luke and I always make tortillas together. He is (almost) 3 years old and you can see him baking with me in my instagram highlights. For now, please keep enjoying my dessert and cupcake recipes. 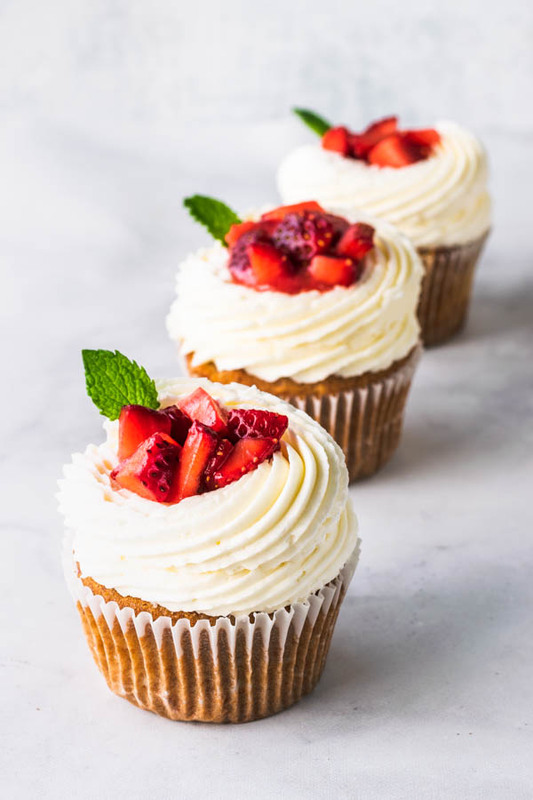 And now let’s talk about these Strawberry Cupcakes. 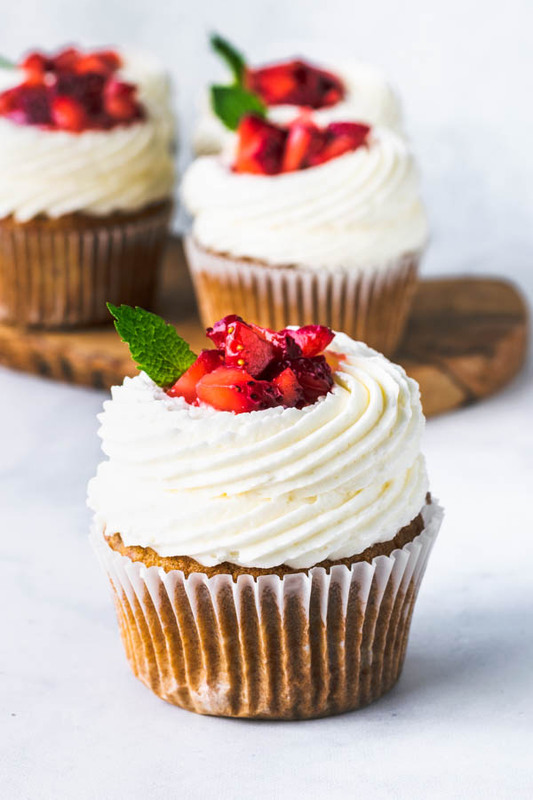 I do like better to call them Strawberries and Cream Cupcakes, but since SEO (search engine optimization) says that I will get more visits on my website if I name the recipe Strawberry Cupcakes instead, that is what I went with, because after all my goal is to reach as many people as possible! I also made a video of these Strawberry Cupcakes being decorated. 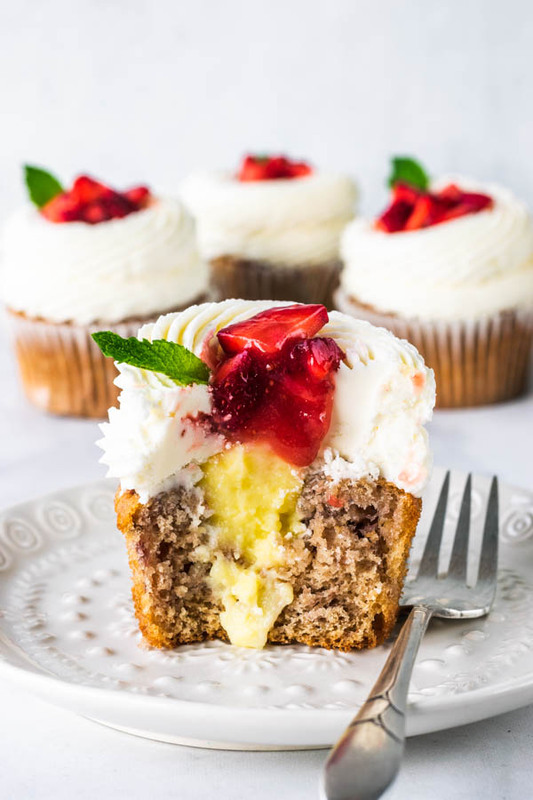 So these Strawberry Cupcakes have a lot of steps, but you can skip some by, for example, using store-bought strawberry jelly, instead of making your own. And check out that beautiful pastry cream that will fill out Strawberry Cupcakes. Those are vanilla bean speckles, but you can use simply vanilla extract if that’s what you got at hand. 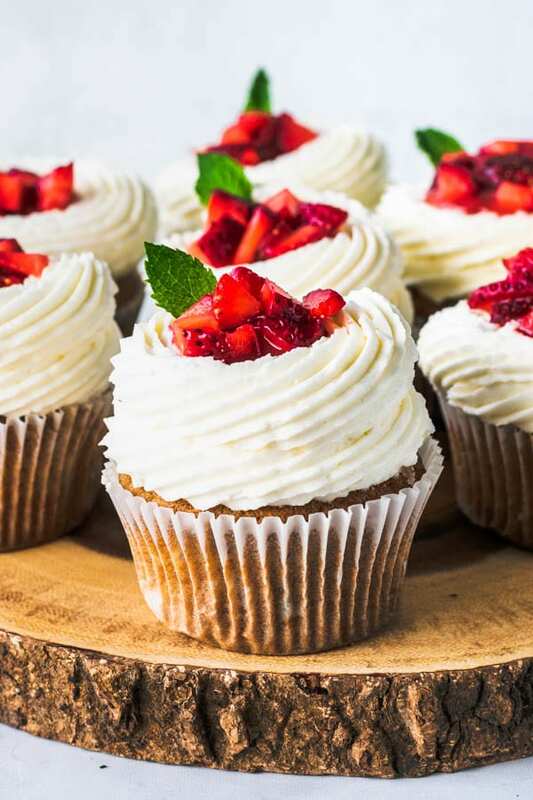 And I know you are dying to see the middle of these Strawberry Cupcakes. So here you go, a cross-section of the cupcakes. I really hope you enjoyed today’s recipe. Make sure to check out some more of my Cupcake recipes, since (almost) every #cupcakemondays I post a new cupcake recipe. 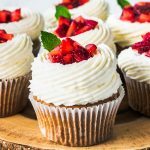 Almost a year ago I posted my first cupcake recipe, and it was actually a Strawberry Cupcake recipe as well, but they were Strawberry Lemonade Cupcakes. You might also like these other cupcakes: Chocolate Strawberry Cupcakes, Pomegranate Cupcakes, Grape Cupcakes, Almond Cupcakes. 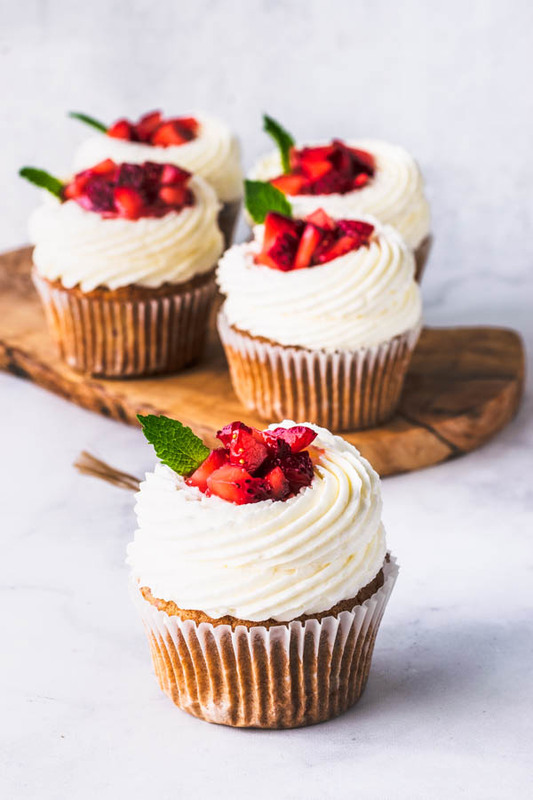 These are my special Strawberries and Cream Cupcakes. 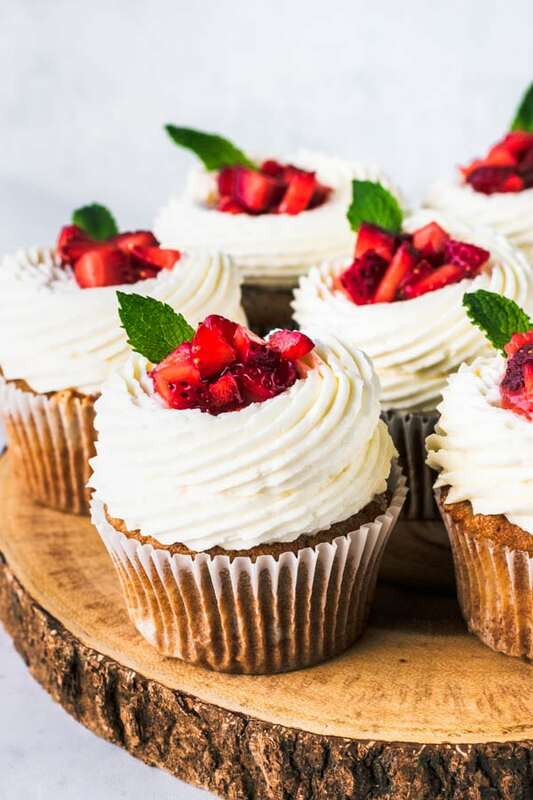 They are filled with pastry cream, frosted with buttercream, topped with strawberry jelly and fresh strawberries. Line 18 cupcake molds with a cupcake liner or grease them with butter and flour if they aren’t silicon. Set aside. In a mixer, cream butter for 1 minute. Add sugar and cream on high for another 2 minutes until mixture is very fluffy and whitened in color. Add eggs, one a time, waiting for the first egg to be incorporated before adding the next egg. Add vanilla. Mix to combine. Add strawberry puree, and yogurt. Add dry mixture and fold with a spatula until incorporated. Don’t overmix. Pour evenly in the cupcake pans. Bake for about 15 minutes, rotating in between. Cupcakes will be done baking once you can gently poke the top of the cupcake with your finger and it will spring back. Whisk milk, half of the sugar, and the vanilla bean seeds (and you can add the pod in there too to help infuse the milk). If you aren’t using vanilla bean seeds, and using the vanilla extract instead, you want to wait to add it at the very end. If you let your milk mixture infuse, you want to quickly re-heat it for just a little bit before proceeding. Whisk egg yolks, plus half of the sugar, cornstarch, and flour in a bowl. Whisk until mixture is very lightened in color, and a bit runny. Add a couple of tablespoons of the hot milk to egg yolks, while whisking non-stop. Add another couple of tablespoons. Keep doing this while you whisk the mixture. You are tempering the eggs, and avoiding them to cook, by slowly raising the temperature. At the end you can just pour the rest of the milk in. Put mixture back in the pot where you heated the milk, and make sure to strain it before, so you can catch any bits of eggs that may have cooked. Then, use a spatula or wooden spoon to stir your custard over medium heat. Don’t stop stirring, don’t look away, you don’t want it to overcook. Keep cooking and stirring until it starts to get kind of grainy, and then it will start to get really thick and smooth. When the whole mixture is creamy, smooth, and thick, you can turn the heat off. Add butter and mix until melted and incorporated. Transfer mixture to a heat-proof bowl. Let it sit for about 10 minutes and then add the vanilla extract if that’s what you are using. Cover with plastic wrap directly on the surface of the cream. Place it in the fridge until completely cooled down. Once mixture has cooked down and it’s syrupy and the sugar has melted, you can dissolve the cornstarch in water and add that to the strawberry mixture, stirring and cooking over medium heat. Let mixture simmer and get thick, for about 10 minutes. Cream butter in the bowl of a mixer, at medium-high speed for 2 minutes. Turn mixer off. Add sugar. Mix on low until sugar is incorporated. Cream for another 1 minute. Add vanilla and mix to combine. If texture is too stiff, add the heavy cream. Otherwise, it’s ready to pipe. Remove the center of each cupcake with a spoon. Pipe some of the Buttercream Frosting around the edges of the cupcake, leaving the middle and the hole in the center of the cupcakes open. Now place the pastry cream in a piping bag and pipe some in the middle of the cupcake all the way to the top of the frosting. Alternatively you can do this with a spoon. Then, spoon a tiny bit of strawberry jelly on top of pastry cream. Top with chopped fresh strawberries, and I also used a little mint leaf to decorate the top. 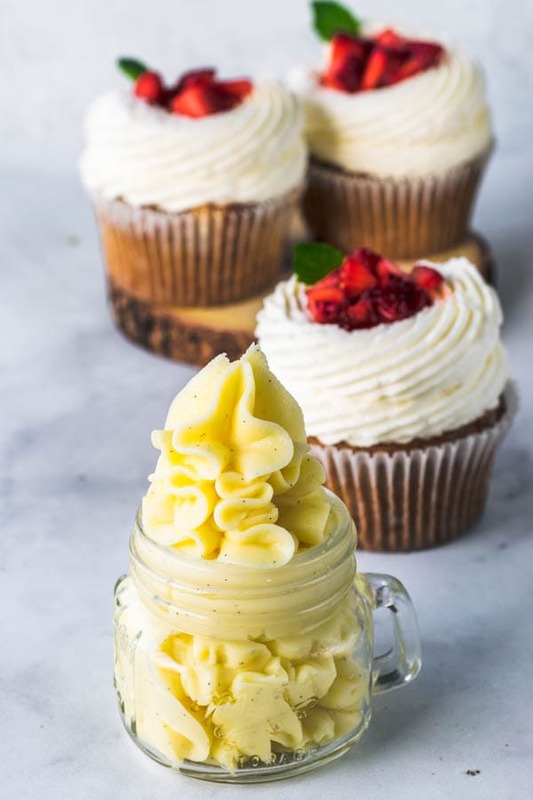 Cupcakes will keep for up to 3-4 days in a closed container, in the fridge. I can totally relate Camila. I named my blog Crumb Top Baking, and I don’t do near enough baking as the name suggests!. I don’t always enjoy taking photos of desserts, but love taking pics of salads! This is all definitely a learning process and finding what we’re good at and enjoy! 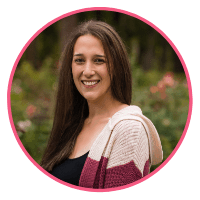 I think you’ve found your niche, so you should definitely run with it! And p.s., I’ve been drooling over these cupcakes since I saw your video yesterday. They look spectacular!